The Roll Media Adapter is an excellent accessory for the SureColor P800, especially if you are a fan of the panoramic image. At a cost below $200.00 it’s an excellent value. 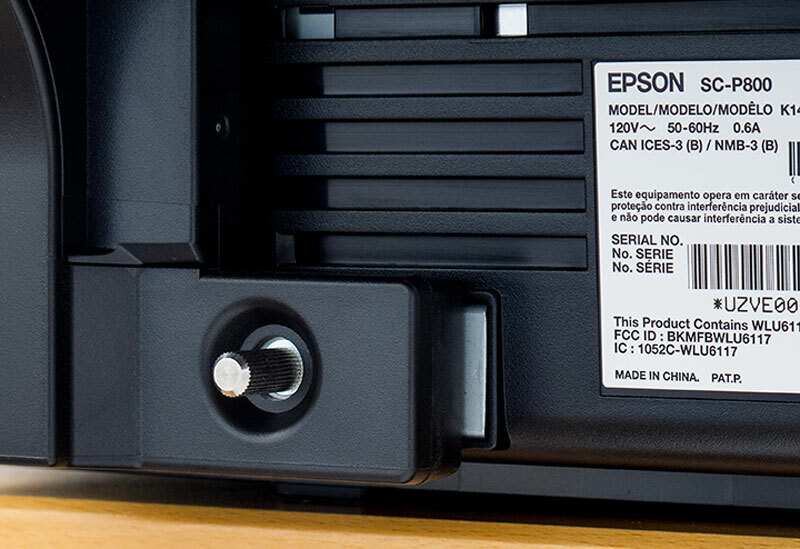 This is a huge improvement over the Epson Stylus Pro 3880, which preceded the SureColor P800. I was able to make prints over 30” long on the 3880, but the process was cumbersome at best. Feeding the media was difficult and the paper didn’t seem to track straight every time. The Roll Media Adapter for the SureColor P800 is pretty beefy. A steel girder connects two stout ends that support the spindle. Two flanges on the spindle guide the roll paper into the printer. 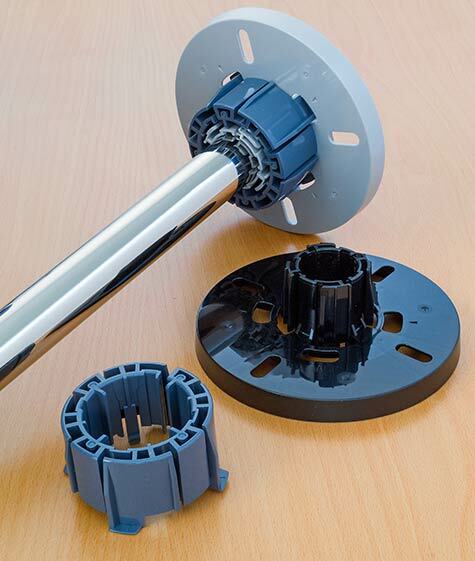 The grey flange is permanently attached to one end of the spindle while the black flange slides onto the spindle to adjust to the width of your paper. The flanges can accommodate media on two-inch core (canvas), and three-inch core (most other fine art media) using the included core adapters. While it is recommended that you use paper between 13 and 17 inches, I was able to print on 10-inch wide paper with no problem. Attaching to the printer is easy. Tilt the Roll Media Adapter and fit the hooks on the adapter into the holes on the back of the printer, lining up the matching arrow icons. Once seated, reach down to push the guide pins into the back of the printer. After you tighten the two knurled screws at the base of the adapter you’ll be ready to load a roll of paper. It’s a good idea to find out what width your favorite paper comes in when you’re in the planning stages of a printing project. While the SureColor P800 can accommodate roll paper up to 17” wide, not all roll papers come in that width. 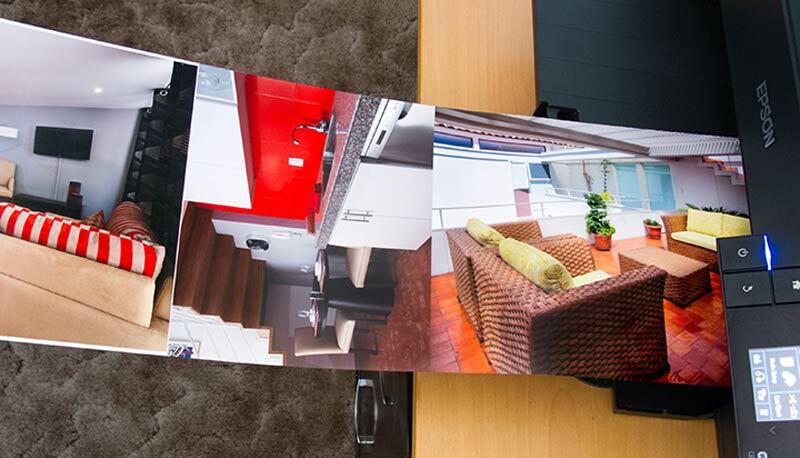 Photo papers like Premium Glossy and Premium Luster come 16-inches wide. Many matt papers, including the Signature Worthy papers and canvas media, come 17-inches wide. You will find a few at 16.5-inches. Call Dennis Haley here at Digital2you or check out the Photo Paper, Fine Art Paper, and Canvas sections of this site. The rear paper support that held the trailing edge of fine art papers becomes the access door for roll paper. The actual loading process has a couple of steps. First, feed the paper into the printer aligning the edge of the paper with the right edge of the Roll Media Adapter until it stops. Then wait. (This is a bit like knocking on the door to let the printer know you wish to enter.) After a few seconds and some clicking noises, the paper will be allowed to move further into the printer. You’ll also get a message on the LCD display telling you to push the paper in further (Come on in!) and touch the load button, also on the LCD panel. Once you press the load button, the printer takes over. Setting up for roll printing in the Epson driver was not difficult. You will have to get familiar with how to make custom paper sizes on your particular operating system. The Windows driver was well behaved. The Mac driver was a little mischievous. Setting margins manually worked fine. 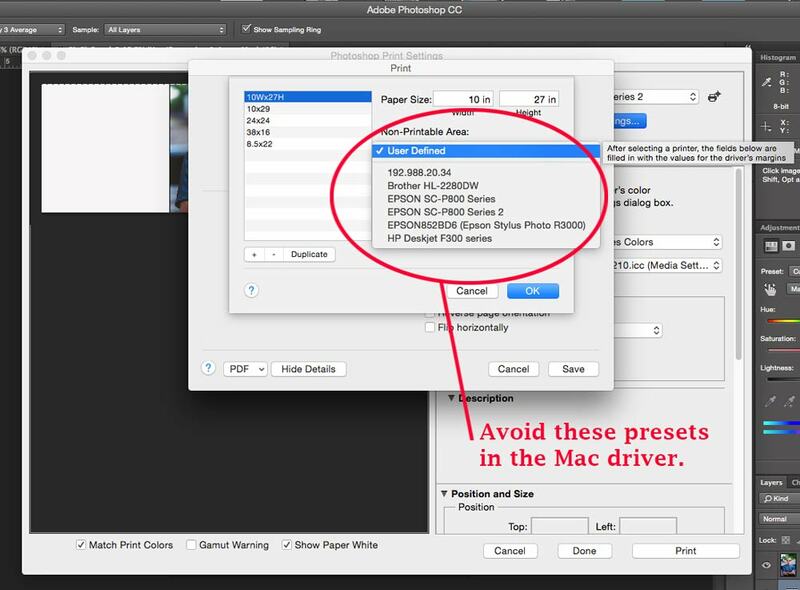 Avoid any of the presets for the printer itself (see illustration). Choosing one of these will change the height and width to something you probably don’t want and you’ll have to start over again. "Print on roll media from 13 inches to 17 inches wide in the true aspect ratio of your art; and up to 10 feet long with no margin in-between"
"Enter the length of your roll paper image as the Height setting (up to 44 inches [1118 mm])." The Windows driver recommends a height somewhere between 2.7 to 590-inches. Hopefully, the length of your image lies in there somewhere. Once the printer finishes, the print needs to be separated from the rest of the roll. Since the SureColor P800 does not have an internal cutter you’ll have to get out the good scissors. 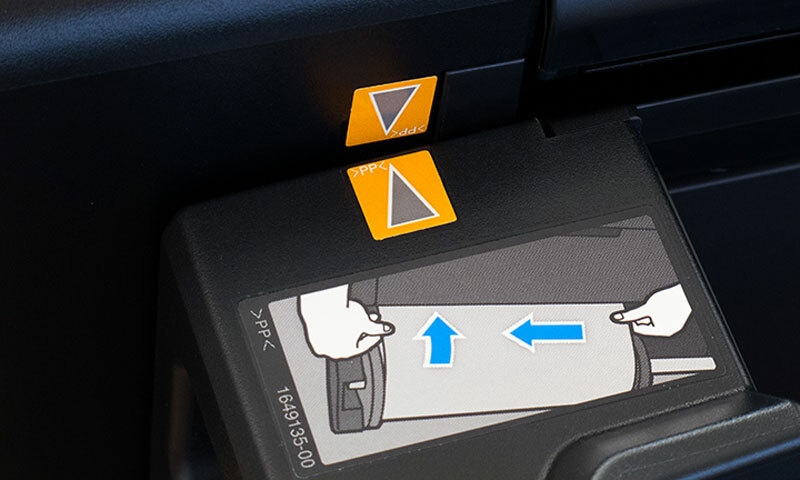 Pressing the Cut/Eject button on the LCD panel will cause the printer to feed a few inches of paper, pause to print a cut line, and advance a few inches more. This leaves you with about seven inches between the cut line and the body of the printer, plenty of room to comfortably make the cut. Follow the cut line closely but don’t worry if it’s a little uneven. The printer isn’t too fussy as long as you’re close. Once you finish cutting, press the Cut/Eject button again and the paper is fed back into the printer, ready for the next print. 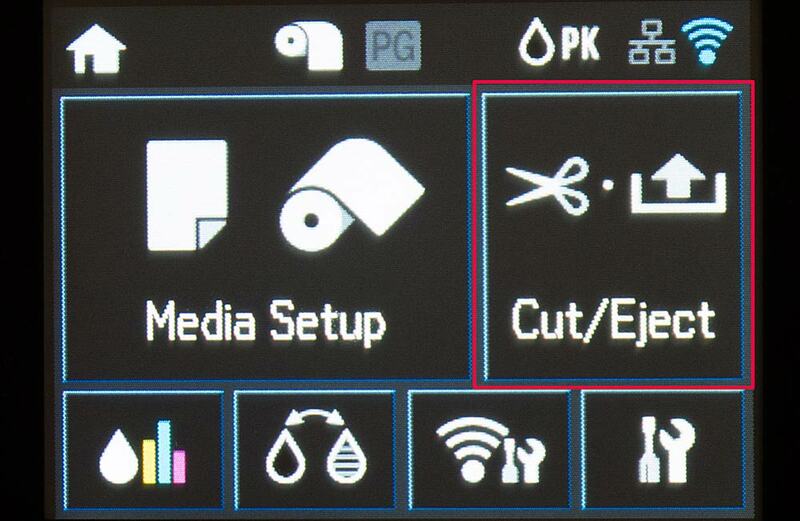 If you’re finished using roll paper, another press of the Cut/Eject button moves the paper backward and out of the printer. Printing panoramas on this printer turns out to be pretty painless. If you want to print consecutive image on roll paper, the SureColor P800 will do that as well. Remember, with shorter prints you will have to contend with a noticeable curl in the paper. Next time I’ll get into the many ways you can connect to the SureColor P800 including printing from your smartphone. Beware of poor roll paper accessory design. With a 17 inch roll of paper the two small claws of plastic that hang this accessory and the weight of the paper off the back of the printer are very poorly designed. Mine broke after a few uses rendering the accessory so much worthless plastic. Epson support has offered for me to just purchase another one at full cost. Not much support. Feeding roll paper is a nightmare. Even after using a paper cutter to get a perfectly straight line it will not accept my paper. I have only used roll paper once before and spent at least 1/2 hour trying to get it to feed. I just spent another 1/2 hour today and it is not feeding. Very aggravating. Agree. Printer will not feed canvas rolls. Called Epson Tech Support, tried several setting changes finally referring problem to their Advanced Product support and they had same problem. P800 will not feed canvas as advertised. Also getting very frustrated trying to refeed my 17" Epson Enhanced Matte Paper. It worked perfectly the first time, but now, no matter how straight I make the cut with my paper trimmer, it will not accept it. I spent money on a tool that makes a perfect cut. I was able to carry the roll only twice and I was never able to carry it, no matter how perfect the cut. So the roller is a completely useless accessory. Tried new roll paper feed today. Nothing. Printer will not recognize the paper has been fed into the feeder. Very frustrating. Feeding the canvas in can sometimes be a bit of a pain but I have managed to use up two 15 metre rolls with no problems so far. I only hope that my paper roll which I am having delivered next week is just a successful. I'm used to feeding roll paper to my older Espon printers without a hitch. But the P800 roll paper mode is another story. I can't get the printer to center the images, can't get it to produce a 16" X 20" sheet (it seems to decide on its own to print the sheet to 23") and have a very hard time getting the printer to "catch" the paper feed. It takes about 8-10 tries to get the printer to catch the paper and move forward from there. I'm returning the roll feeder accessory tomorrow. I'll cut the sheets myself, just like I've been doing for the past couple of years. What a waste of time and money. Hello I have experienced problems of the printer not recognising the film roll too. What we have figured out at the end was, it doesn't recognise the film roll because it is transparent, we figured out it will work almost every time if we use a marker pen to mark on the two corners of the film to begin with(to trick the sensor to believe that there is paper fed into it).It sounds silly but it works.